Worried about carbon monoxide emissions in your home? Put those fears aside with a carbon monoxide detector that sounds an 85dB alarm when it senses dangerous levels of this colorless, odorless and potentially lethal gas. But unlike standard carbon monoxide alarms that you have to unplug to stop a false alarm (creating a hazard if you forget to plug it back in), this one can be silenced, or tested, with your TV remote control! 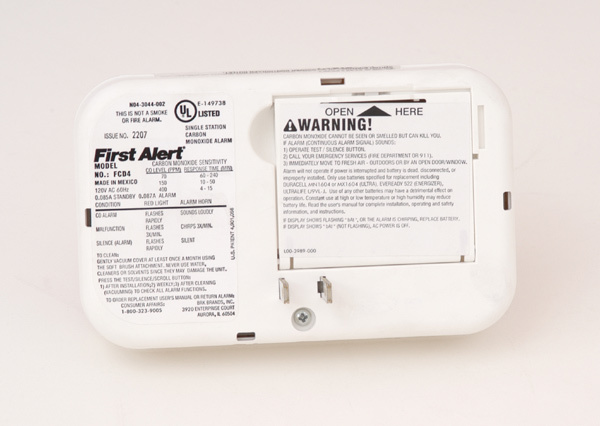 The Remote-Controlled Carbon Monoxide Detector plugs into any standard AC outlet and requires a 9V battery (included) for continuous operation, even if the home's power is interrupted. Simply use the VOLUME or CHANNEL buttons on any infrared remote control to test or silence the carbon monoxide alarm from up to 12 feet away. It works with virtually any infrared remote control, regardless of the make or model — no special programming is needed! And since silencing the alarm is so incredibly easy and convenient, it eliminates the temptation to unplug it and jeopardize your family's safety. Carbon monoxide comes from flammable fuels such as natural gas, propane gas, heating oil, kerosene, coal, charcoal, gasoline or burning wood with insufficient oxygen. At low levels, it causes symptoms similar to the flu, like headaches, fatigue, nausea, dizzy spells, confusion and irritability. As levels of carbon monoxide increase, vomiting, loss of consciousness and eventually brain damage or death can result. The International Association of Fire Chiefs (IAFC) recommends a carbon monoxide detector for every level of your home and in areas that are potential sources of this deadly gas, such as gas or oil home appliances like furnaces, clothes dryers, ranges, ovens, water heaters and space heaters. Carbon monoxide can also come from fireplaces, charcoal grills, wood-burning stoves or from a running car in an attached garage. The Remote-Controlled Carbon Monoxide Alarm offers the added benefit of a digital LCD screen that displays the parts-per-million level of carbon monoxide (CO) present — the information many fire departments request before investigating the carbon monoxide source. A memory feature lets you check the highest level of CO recorded during an alarm. Levels are saved, even after a power interruption, until you clear it. This feature is crucial if you plan to call someone to investigate the CO problem. Dimensions: 5 1/4" x 3 1/4" x 1 1/4"